The Company is working towards recommencing underground production at the Premier site near Stewart, BC using existing facilities and infrastructure (mill building, tailings facility, underground development and power line). As a first step, the Company completed a maiden underground resource at Premier/Northern Lights and reported the results on May 10, 2018. The current drill program commenced on April 16, 2018 and is an integral part of the second step in the process. The program is designed to extend mineralized zones at Premier/Northern Lights; convert current resources from inferred to indicated in existing zones (including the 602 zone); and to delineate high-grade zones in the Big Missouri/Martha Ellen area located 5km further north. The overall purpose is to add to the existing resource base to support initial engineering studies that commenced in June 2018. This news release summarizes the results of nine drill holes at Big Missouri and 21 drill holes in the Premier/Northern Lights area. The drill holes at Big Missouri were drilled to the southwest of the S1 pit (see Figure 1) while drill holes at Premier/Northern Lights were targeted on extensions of the 602 and Prew zones. Four holes were drilled in the Lunchroom zone and seven exploration holes targeted the Sebakwe zone to the northeast of Northern Lights outside of the current resource area. The holes at Big Missouri were drilled from two separate pads (BM5 and BM2) and intercepted mineralization on two different elevations. Six of the nine holes intercepted the Province zone, a flat lying breccia body near surface while the main target at Big Missouri is the deeper Big Missouri breccia zone that is usually intercepted at a depth of 150m-180m. This zone is the continuation of the mineralized horizon that was successfully mined in the S1 pit. All drill holes intercepted the breccia zone at anticipated depth, but there also appears to be a northeast-southwesterly trend that controls the high-grade zones within the breccia bodies. Detailed characteristics of this trend will have to be investigated more fully by future drill holes or possibly geophysical techniques. Drill results from Big Missouri are summarized in Table 1. 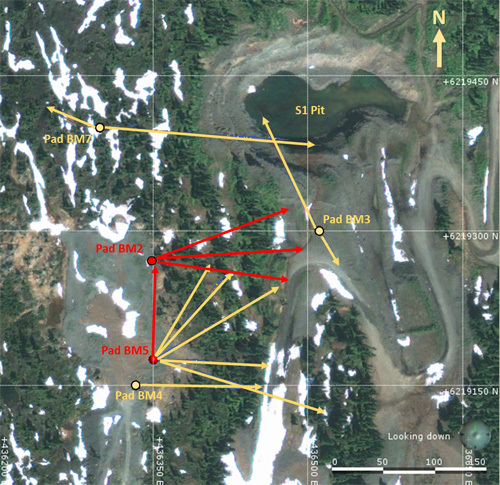 Figure 1 Plan view of the S1 pit area at Big Missouri showing the pad locations and drill traces of the drill holes reported in this release (red traces are holes in this release, tan coloured traces have been reported previously). Table five details which holes are drilled from pads BM2 and BM5. Table 1 Summary of the drill results from nine drill holes at Big Missouri. Four drill holes were targeted on the Lunchroom zone below the Premier open pit, five kilometres to the south of Big Missouri. These holes were drilled parallel to the dip of the mineralized zones using oriented drill core in order to obtain structural information for the high-grade veins that are hosting the majority of the coarse gold/electrum at Premier. The drill core from these holes will also be used for confirmatory metallurgical optimization test work in the course of ongoing engineering studies. The holes intersected high-grade mineralization and provide material from one of the zones that will be targeted early in the anticipated mine life. Drill results from the Lunchroom zone are summarized in Table 2. Table 2 below summarizes the drill results from the Lunchroom zone at Premier/Northern Lights. The holes in this table were drilled parallel to the dip for structural and metallurgical analysis of the zone and display dip extent and not true thickness. Several holes were drilled in the 602 zone and its extensions as well as the Prew zone in the Premier/Northern Lights area. Holes P18-1648 through P18-1651 were aimed at the northern down dip extent of the 602 zone and intercepted mineralization at the expected depth. Hole P18-1648 intercepted very good grade at two different elevations, extending one of the higher elevation subzones of 602 by about 50m. Three more holes (P18-1627, P18-1628, P18-1666) were drilled toward the north-northwest and did not intercept the breccia zone, possibly running parallel to the zone due to limited options for pad locations in this area. The best potential for extending the 602 zone appears to be toward the west-northwest where surface access was difficult due to the topography and heavy vegetation. Pads have now been constructed to explore in this area and results from this work will be reported in the future. A fan of five drill holes was completed at the down dip edge of the Prew zone in Northern Lights. Holes P18-1655 and P18-1656 intersected mineralization at the expected depth and extend the mineralization in this area by about 60m to the northwest. Hole P18-1654 intercepted the breccia zone but did not encounter significant mineralization while holes P18-1657 and P18-1658 represent significant step outs of 200m and more where there is little control on which way the zone is striking and dipping. Surface drilling in this area is hampered by the limitations on drill pad locations due to previous open pit mining activities (i.e. steep waste dumps) similar to the limitations at 602. The good drill results from both 602 and Prew demonstrate that several zones of the May 10, 2018 resource are still open along strike and down dip. Future exploration in these areas will best be conducted from underground infrastructure in order to improve precision of targeting and save meterage. Drill results from 602 and Prew are summarized in Table 3. Table 3 below summarizes drill results from the 602 and Prew zones at Premier/Northern Lights. The modeled zones in the Premier/Northern Lights resource area are either part of the Premier fault zone (602, 609, Lunchroom, Obscene and Premier Main) or of the Northern Lights fault zone (Ben, Prew and Northern Lights Main). In the very northeastern corner of the Premier/Northern Lights area, there is an old stope area that suggests that there may be a third fault zone to the north of the Northern Lights fault plane. This area is called Sebakwe and as part of the brownfield exploration program, seven holes were drilled into this not well understood area. Table 4 shows that three of the holes intercepted mineralized breccia with highly anomalous gold and silver. Four more holes (P18-1698 to P18-1701) were drilled in a wide step out to the northeast of the area of known mineralization. These holes did not intersect the targeted fault plane possibly due to incorrect assumptions for the orientation of the plane. The successful holes indicate that there is an entire fault plane to the north of Northern Lights that warrants exploration and holds potential for high grade zones comparable to the ones at Premier and Northern Lights. The Company will employ geophysical techniques to define future drill targets in this area. The possibility of additional mineralized zones to the north of the known mineralization in the 5km gap between Premier/Northern Lights and Big Missouri remains high. Table 4 below shows drill results from exploration holes in the Sebakwe area. The orientation of the targeted zone is not well defined. True width is believed to be approximately 50-80% of reported intercepts. Table 5 below lists the drill pad locations. Graeme Evans, P. Geo, and Lawrence Tsang, P. Geo, the Company’s Project Geologists provide the field management for the Premier exploration program. Graeme Evans, non-independent Consulting Geologist, is the Company’s Qualified Person (QP) as defined by National Instrument 43-101 and has reviewed and approved the technical contents of this news release. Analytical work is being carried out by ALS Global (“ALS”) and SGS Canada Inc (“SGS”). Ascot’s quality-assurance and quality-control program includes the use of analytical blanks to monitor for cross contamination, certified reference material standards to assess analytical accuracy, and duplicate samples to quantify sampling precision. This is in addition to the internal quality assurance program employed by ALS and SGS. At ALS and SGS, samples are dried and weighed. They are then crushed to 75% passing 2mm, with 250g split and pulverized to 85% passing 75µm. Since early June, samples are crushed and split on site by a mobile lab supplied by SGS and run by SGS personnel. All samples are digested using aqua-regia with an ICP-AES finish and fire assay with AA finish for gold. Samples over 100ppm silver are digested with aqua regia and then volumetrically diluted before an ICP-AES or AA finish (up to 1,500ppm). Samples over 1,500ppm silver are fire assayed with a gravimetric finish. Samples over 10ppm gold are fire assayed with a gravimetric finish. Identified or suspected metallic gold or silver are subjected to “metallics” assays. Sampling and storage are at the company’s secure facility in Stewart.